If you have ever had to get a stubborn child out of bed or even attempt to keep a younger child in bed you know that a fun alarm clock can be your best friend. The right alarm clock can make life easier for parents that face the challenge of a child that struggles with their sleep habits. 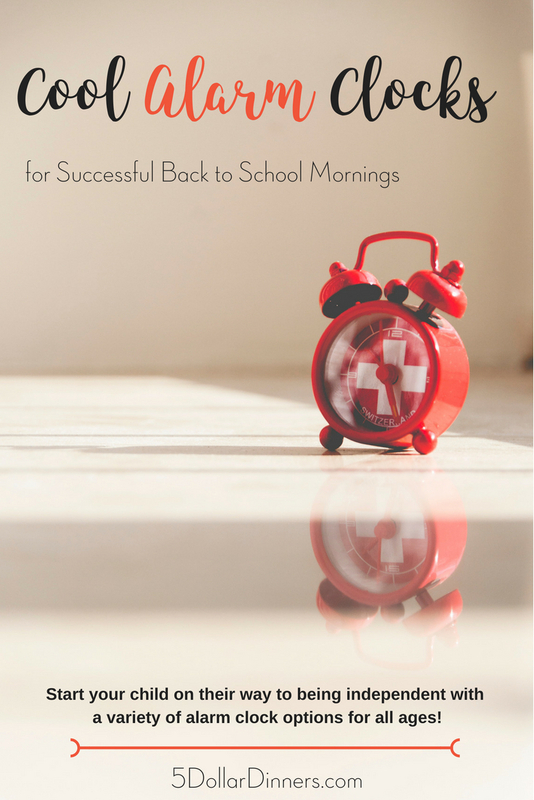 When the school year starts, give yourself an advantage with one of these cool alarm clocks that will get your kids out of bed. This Toddler Stay-In-Bed Kids Light Alarm Clock will help get your young child to understand that they need to stay in bed until time to get up for the day. Once they learn to follow the alarm clock they can get a better more restful night of sleep. A Sunrise Alarm Clock designed to light up and play music is a great way to start your child’s day without the harsh alarms that can make an anxious child start off on the wrong foot for the day. Another great option for your preschool or kindergartener is a fun Stoplight Sleep Enhancing Alarm Clock for Kids. The red yellow green stoplight is easy for kids to understand. Sometimes the best alarm clock for kids is something that fits their personal interests like this Dreamworks Trolls Alarm Clock with Music and Night Light that blasts the cheerful music found in the Trolls movie. If your child is a fan of the LEGO Batman Movie you can grab an alarm clock with one of the key characters to match their room and make waking up for the first day of school fun and exciting. This Peppa Pig Alarm Clock is so cute and will make young Peppa Pig fans jump for joy. LYour little ninja need an alarm clock that will catch their interest? the Lego Kids’ 9001154 NINJAGO Cole Minifigure Alarm Clock is loads of fun. Want flat out Lego for your LEGO fan? How about this classic light up red brick alarm clock? This EasyRead Time Teacher Children’s Alarm Clock is fun and exciting for little ones and is great for teaching kids to read time in both standard and military time. Have a REALLY heavy sleeper on your hands? How about the Sonic Alert Dual Alarm Clock with Bed Shaker. This alarm will shake the bed and keep your stubborn sleeper from falling back to sleep. This Alarm Clock for Heavy Sleepers does not turn off until your feet are on the floor. This is a great way to stop your teen from hitting the snooze and being late to school. How about an alarm clock that runs away from you? CLOCKY the Original Runaway Alarm Clock on Wheels will roll off the nightstand and across the room forcing you to get up and out of bed to chase it down and turn it off. Have a teen that is fitness minded. eSmart Shape up Dumbbell Alarm Clock requires your teen to sit up and perform basic exercises before the alarm shuts off. This is a great way to get the blood flowing to the brain as well before school.